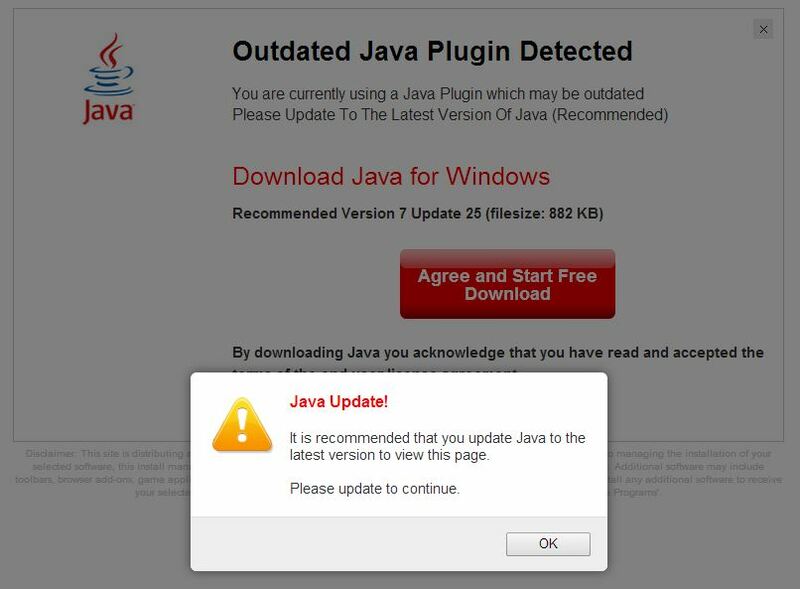 I recently came across a website that would redirect users via an ad network to a site posing as a Java update page. The site as since been notified and fixed, but here are the details. After sitting on a page for a little bit, the page would eventually redirect to a page that looked something like the page below (more details below). So you would be on a page you normally would visit, then in a few seconds, boom, you would be asked to install some malicious software! This page, would prompt the user to download and install a file called Java.exe. This file, after being scanned on virustotal.com, showed that it was a DomaIQ adware/malware variant. If you happened to actually run the installer and installed the malware, I recommend using Malwarebytes Anti-Malware to remove these types of nuisances. Malwarebytes offers a free version that you can use; check out their site, https://www.malwarebytes.org/ for more information. When you are first redirected to the page, there is a popup telling you that your Java version is out of date. 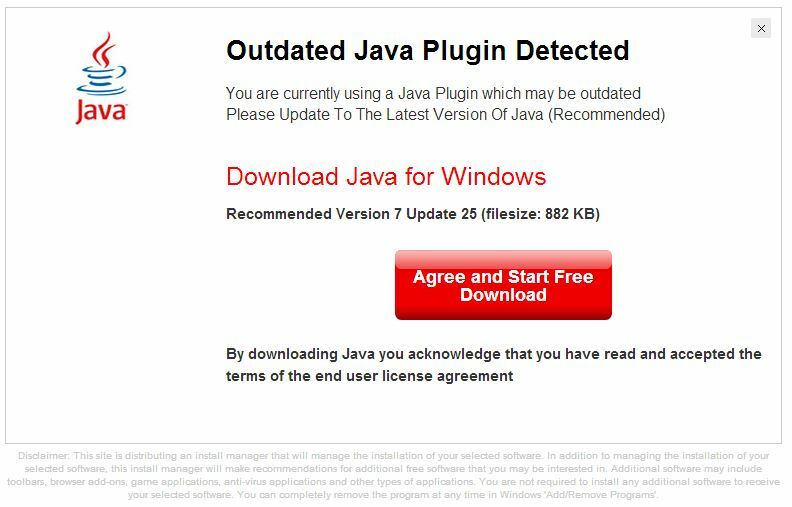 When you click on OK, you are prompted to download a Java.exe application. If you download the application you will see it is signed and valid to be run, the application is signed by Clovermedia SL. 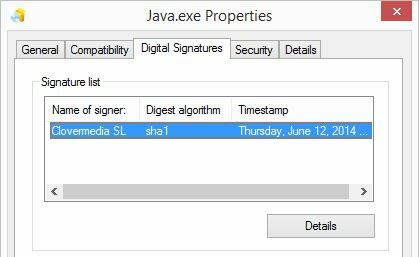 It looks like the file is very recent version of the application because the sign date is June 12, 2014 (the same day). For even more information on the file, visit the virustotal page, here. If you look at the URL for the page, it is set to http://www.downdimgd.com. This was my telltale for it not being a real Java update on my initial viewing of the page. The site appears to be hosted in Amsterdam (information listed below) but the name servers seem to be located in the US, by Namecheap, Inc. I have notified Namecheap of the malicious site. address:         19/2 Lva Tolstogo st.
Bottom line, if you are presented with a page like this, check the URL. Especially these days as more and more malware is being spread by fake sites. The same tactic is used to trick people to enter in bank login information, etc. Checking the URL is ALWAYS the first line of defense. And if you are unsure about a website, odds are if it immediately tries to get you to download something it’s probably malicious. Thank you for posting this. I have this file popping up too nearly every day. I’m using Kaspersky. Can you tell me how to get rid of it from showing up as a needed update while using the internet? Generally this is caused by the website you are on, so there may not be anything you can do directly. If you actually installed the software, or multiple sites have this issue for you, you may want to make sure you do not have any malicious adware installed. I would run Malwarebytes or some other anti-malware software to check your system. But other than that, from what I have seen, this is an issue caused by various ad networks on specific websites so it shouldn’t be too wide spread unless you something is installed on your system. If you know of a specific website that has the issue, you should also notify the websites owners if at all possible.